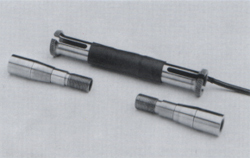 The model T-2640 tie bar force transducer, patented by and proprietary to Helm Instrument Co., Inc. is designed for installation within a drilled hole on the tie bar center line. Tie bar deflections as small as one-millionth of an inch (.000001″) can be measured with linearity and repeatability within one-half of one percent (.05%). Strain gages in a full 350 ohm wheatstone bridge circuit are used to assure long term stability and accuracy. Manufactured under laboratory conditions, all T-2640 force sensors are matched within 1% and may be interchanged without recalibration. The model T-2640 transducer is installed directly within the drilled hole and permanently mounted by expanding the sensor body with front and back tapered bushing assemblies to create a press fit. 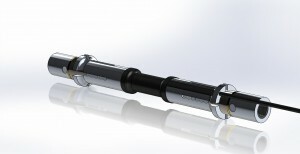 As a result of its unique design, the sensor is secured without pre-load affording accurate calibration mathematically. Tie bar strain levels are uniform throughout the entire tie bar length between the tie bar nuts. 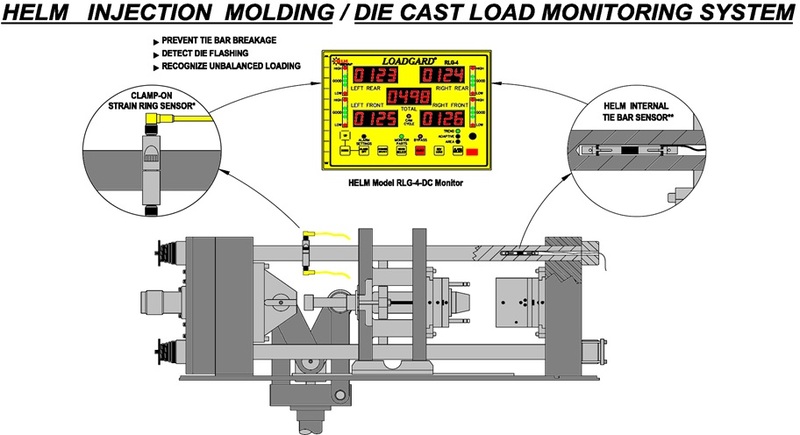 The model T-2640 transducer can be installed from either the shot end or clamping end of the machine.